Keane with Sheringham back when he was unveiled last November. INDIAN SUPER LEAGUE (ISL) club Atletico de Kolkata (ATK) are reportedly weighing up whether to offer Robbie Keane their manager’s position until the end of the season. Having sacked former Tottenham and Manchester United striker Teddy Sheringham last month after several disappointing results, the two-time domestic champions handed director of football Ashley Westwood the role on an interim basis. However, under ISL rules, Westwood can only manage the club for three matches as he does not meet the criteria of a ‘marquee coach’. 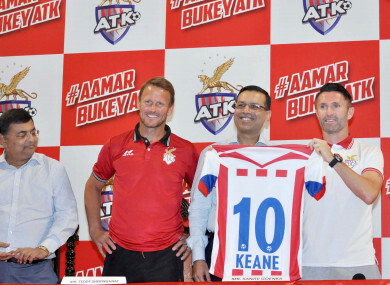 Indian media outlet Sportskeeda are reporting that ATK could give 37-year-old Keane the chance to work as player-manager for the remaining five matches of the campaign. Ireland’s all-time record goalscorer has endured a disappointing spell so far, with injuries restricting him to just six appearances — and two goals — since joining back in November. The Dubliner has spoken in the past about his ambition to go into management and this could provide the first step. ATK sit eighth in the table with 12 points from 13 matches. Email “Robbie Keane in line to take player-manager role in India - Report ”. Feedback on “Robbie Keane in line to take player-manager role in India - Report ”.